The Royal Mint have announced today (26th July) that the special £5 silver crown minted in honor of the newest member of the Royal Family, His Royal Highness Prince George Alexander Louis of Cambridge – son and first child to the Duke & Duchess of Cambridge, has sold almost 80% of the stock produced. The coin, a silver crown depicting the iconic rendition of St. George slaying the dragon by famed medalist and sculptor Benedetto Pistrucci was used as a commemorative design and it was fitting that when it was announced that the new Prince would be named “George” this sent the coin straight on to becoming a sell-out in a short period of time. The coin’s reverse had not been seen on British crown coins since 1951 when a commemorative 5 shilling coin was issued in honor of the Festival of Britain. A silver version was not produced since 1902 when it was used on the inaugural coins of King Edward VII. This particular issue is considered by most avid British coin collectors to be the definitive coin of the current monarch Queen Elizabeth II as this beautiful British design has never been used before on any of the commemorative or circulation crown coins before or after decimalization. Five previous monarchs have issued a circulation or commemorative crown coin using the Pistrucci design since its debut in 1817. The Royal Mint offers a behind the scenes look at one of the dies which was used for the coin’s production as well as a firsthand look at the finished product. (Click above for a larger image.) The mintage for this key classic was set at 10,000 pieces produced to proof quality. Collectors who wish to acquire this coin are urged to place an order soon to avoid disappointment. The birth of the new Prince George was announced on the 22nd July and the baby’s name was announced on the 24th after a visit from the child’s great-grandmother Queen Elizabeth II – the name George is thought to be tribute to her own father who ascended the throne in 1936 as King George VI. Dispatch of this coin is expected to commence from the 23rd August. The new prince was born on Monday July 22, 2013. Within two days the Royal Mint sold out all of its limited edition 2,013 uncirculated Gold Sovereigns Struck on the same Day of The Royal Birth. Those uncirculated Gold Sovereigns were sold for the outrageous price of £800.00 (~$1,230.40) each. The gold content of a gold sovereign is 0.2354 troy oz. That means for those expensive £800 gold coins, the price of gold would have to rise to $5,226.85/troy oz. for those coins to be equivalent to their intrinsic gold content. However, there are still available at the Royal Mint the 2013 Brilliant Uncirculated Gold Sovereigns for £325.00 (~$499.43) each and the 2013 Gold Proof Sovereigns for £450.00 (~$691.61). As of today Saturday 27 July 2013, the Royal Birth £5 Silver Crowns are now all sold out. Sold out at the mint now. You can register to be put on a waiting list. The 5 pound coin is very nice but the Royal Mint is notorious for price gouging everything. The coin costs over $120 and doesn’t even contain one ounce of silver. And the coin is not pure silver but .925 silver. I’ll be curious to see if there will be a great demand for the coin in the secondary market which will spike the price. On the secondary market such as on ebay, the sold out £5 sterling silver coins are reselling for twice their original issue price. Similarly the sold out limited edition 2,013 uncirculated Gold Sovereigns Struck on the same Day of The Royal Birth are reselling at exorbitant prices. guys, if you buy a coin from the mint, why waste your time worrying about whether or not there is an ounce of silver or how much above spot you are paying. You are purchasing a limited mintage coin for the numismatic value…….if you want bullion without the premium, then buy bullion, but understand the mint is not selling this to cut you great deal on silver. The people buying this on the secondary market, unless the are stupid, are also obviously not buying this for the bullion value. It is an apples – oranges argument. Too late now. The Singapore Mint has just sold out all of its allotment of the Royal Mint’s Royal Birth £5 Sterling Silver Crowns. On ebay today Tuesday July 30, 2013 @ 09:34:07 PDT, a Royal Birth £5 Sterling Silver Crown sold for the outrageous price of $471.00! That’s 3.86X more than the Royal Mint’s original issue price of £80. To be honest, I didn’t think it would take this long for this exquisite coin to sell out as it has. I have dropping hints to the Royal Mint for years advising that the Benedetto Pistrucci classic would be THE definitive crown of the Queen’s long reign and that it should have been issued long ago. I am sorry that so many collectors will have missed out on this particular coin – Please e-mail the RM & ask for another issue of this crown. I do hope that the RM will re-visit this idea again, either for the Queen’s 90th birthday (2016) and to differ this coin with a new issue, include the edge inscription normally seen on these crown coins. 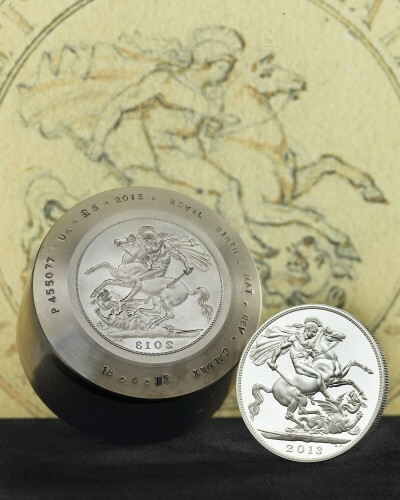 There is also the 200th anniversary of the introduction of Pistrucci’s St. George slaying the dragon which was first used on the five shilling coin in 1818 so… there may still be the chance for this traditional coin reverse to be issued one more time during this, possibly the longest reign in British history. In any event, I’m grateful the Royal Mint took this opportunity, the birth of the new Prince George to finally right the wrong which so many of us who are avid Britisg crown collectors – and finally issue this specific coin. Item #AV092. Description: GB 2013 £5 St George & The Dragon Royal Baby Silver Proof. It has not been since 1902 that the last sterling silver crown coin featured on its reverse side Benedetto Pistrucci’s design of Saint George and the dragon. That occurred 111 years ago for the coronation year of Queen Elizabeth II’s great-grandfather, King Edward VII. Therefore the 2013 £5 sterling silver crown will surely be of historic numismatic significance. Some of you who have ordered the £5 silver royal baby crown – as I did, will begin to receive your order very shortly – again as I did today. I’m pleased to say, upon inspection, the coin is everything I hoped it would be! I think other collectors will also be especially pleased. Unfortunately, the coin with a total mintage of 10,000 pieces was reported to have sold out within one week of its official launch, the date of birth of the Queen’s Great-grandson, Prince George of Cambridge. I do hope the Royal Mint will have another opportunity to issue this extraordinary and historic reverse design again during the reign of Qneen Elizabeth II as this is really a “must have” for serious crown collectors. Watch this space, I’ll bring you any further information on the subject.